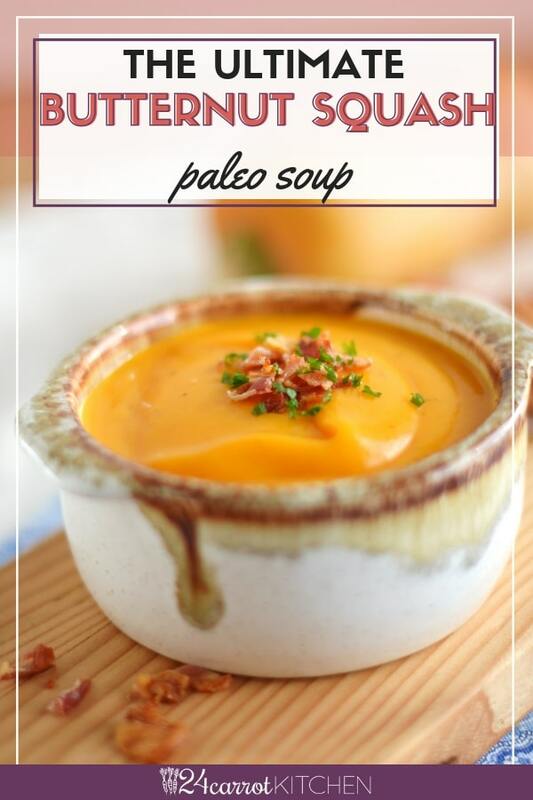 Home » Soup » The Ultimate Paleo Butternut Squash Soup – 3 Easy Ingredients! 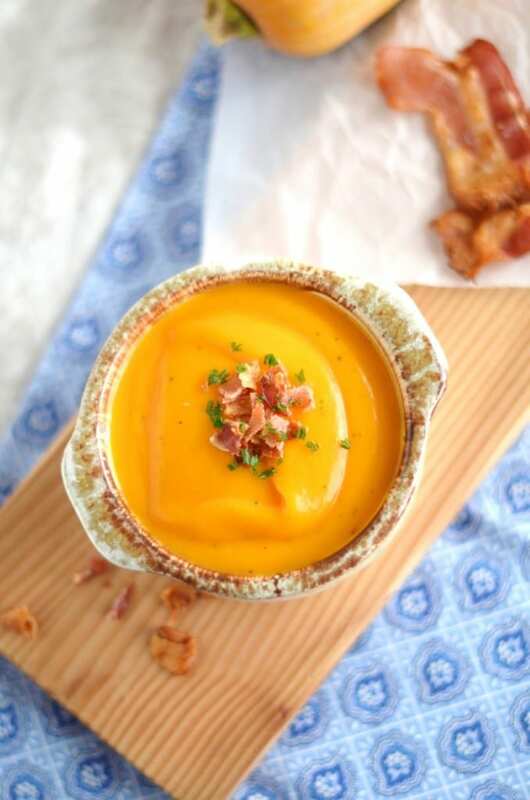 There are only three ingredients in this delicious, healthy Paleo Butternut Squash Soup! And it is Whole30, grain, gluten and dairy free! ‘Tis the season for butternut squash. I can usually find great sale prices on butternut squash in the fall. Combine that with fall being a great season for soup as the days and evenings get chillier and it’s a win-win. Prepping the butternut squash is not hard, but you do have to cut it in half, which can be awkward. I wash and dry mine, place it on kitchen towel for leverage, and then using a sharp knife, carefully slice it lengthwise. Once cut in half, remove the seeds. Then I sprinkle each side with some sea salt and place cut side down (flesh) on a baking sheet lined with parchment paper. Bake at 400 degrees F. for about 45 minutes or until tender when pricked with a knife. When I notice the outer “skin” starting to have brownish spots, I know it is done. Here is an alternate method for cutting and roasting your butternut squash. Take out and let cool, so that you are able to scoop out the squash. Scoop the cooked, cooled butternut squash directly into a blender. Add the other ingredients and blend for a few minutes until you have your preferred consistency. Add either more chicken stock or coconut milk if your soup is too thick and you want to thin it out. It makes great leftovers or lunch the next day as well. Favorite products used for success with this recipe – Blender (I like this one and this one), coconut milk , sea salt. I usually use my homemade Chicken Stock/Bone Broth recipe. Hope you enjoy this healthy Butternut Squash soup as much as I do! This delicious, grain, gluten and dairy free soup is so easy to make! Cut butternut squash in half, lengthwise, remove seed and place cut side down on a large baking sheet lined with parchment paper. I usually sprinkle each side with a pinch of salt before placing on baking sheet. Bake for about 45 minutes until a knife inserted easily. The skin of the butternut squash could start to have some brownish spots. That's okay, and that lets me know it is done as well. Scoop out butternut squash and put in a blender. Add the rest of the ingredients and blend for several minutes until soup is creamy. Add more chicken stock (or coconut milk) if too thick and needs to be thinned for desired consistency. Consume right away or can be stored in the fridge for several days and heated up later. Previous Post: « Simple Paleo Pumpkin Bars That Are Irresistible! 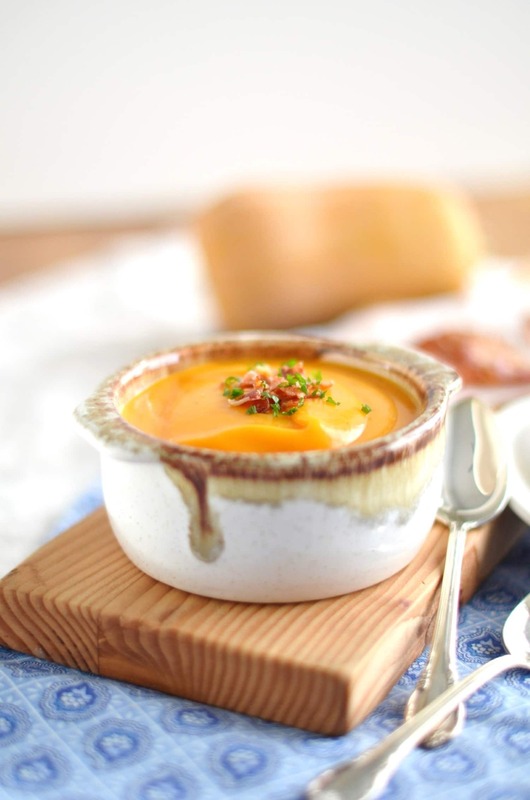 Thanks Megan – I love this soup! Since I usually have frozen stock on hand, it’s the easiest soup to make too. This looks so incredibly thick and creamy! And just a few healthy ingredients too! Love it! Thanks Renee! It is one of my go-to recipes! This soup sounds fantastic. Love using coconut milk. This is a nice quick and easy soup to make during the week. Thanks Gloria! 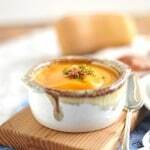 It is so easy to make this soup! Loving this simple, healthy and ever-so delicious soup; thanks so much for sharing! Thanks and love your comment! Thanks Sherri! This recipe freezes really well also.